Kick off your visit on the 20th (Sat): step into the grandiose world of Chateau du Taillan, learn about winemaking at Chateau Paloumey, then do a tasting at Chateau Lamothe-Bergeron, then learn about winemaking at Chateau Beaurang, and finally do a tasting at Chateau Guadet. Get ready for a full day of sightseeing on the 21st (Sun): steep yourself in history at Abbey of La Sauve-Majeure, do a tasting at Chateau Ambe Tour Pourret, and then learn about winemaking at Chateau Mauvinon. To see traveler tips, ratings, more things to do, and other tourist information, read our Bordeaux trip site . Minneapolis, USA to Bordeaux is an approximately 15-hour flight. The time zone difference moving from Central Standard Time (CST) to Central European Time (CET) is 7 hours. Traveling from Minneapolis in April, expect Bordeaux to be somewhat warmer, temps between 64°F and 46°F. Finish your sightseeing early on the 22nd (Mon) to allow enough time to take a train to Montauban. Montauban is a commune in the Tarn-et-Garonne department in the Occitanie region in southern France. On the 22nd (Mon), examine the collection at La Maison Romane, shake up your sightseeing with Nature-Escapade, and then contemplate in the serene atmosphere at Eglise Saint-Corneille. On the 23rd (Tue), you'll have a packed day of sightseeing: get to know the fascinating history of Abbaye de Belleperche, admire the landmark architecture of La Halle Aux Grains d'Auvilar, then look for gifts at La Hutt a Fromage, and finally take in the architecture and atmosphere at Eglise Saint-Jacques de Montauban. For where to stay, reviews, maps, and other tourist information, read our Montauban trip maker . Take a train from Bordeaux to Montauban in 2 hours. Alternatively, you can drive. In April, daytime highs in Montauban are 64°F, while nighttime lows are 46°F. Wrap up your sightseeing on the 24th (Wed) early enough to drive to Avignon. Visit Abbaye Notre-Dame d'Aiguebelle and Cathedrale Notre-Dame de Nazareth for their historical value. Colophon - Maison de l'Imprimeur and Natural History Museum of The Ardeche will appeal to museum buffs. You'll find plenty of places to visit near Avignon: Gabriel Meffre (in Gigondas), Fondation Villa Datris (in L'Isle-sur-la-Sorgue) and Montelimar (L'Artisan Nougatier & Le Chaudron d'Or). The adventure continues: learn about winemaking at Chateau Bizard and see the interesting displays at Museum Alphonse Daudet. For photos, where to stay, maps, and tourist information, read our Avignon trip maker site . You can drive from Montauban to Avignon in 4 hours. Other options are to do a combination of flight and train; or fly. In April in Avignon, expect temperatures between 68°F during the day and 46°F at night. Finish up your sightseeing early on the 26th (Fri) so you can catch the train to Paris. For shopping fun, head to Ecole Supérieure d'Art et Design Le Havre-Rouen or Faiences Saint-romain. Popular historic sites such as Gros-Horloge and Beauvais Cathedral are in your itinerary. 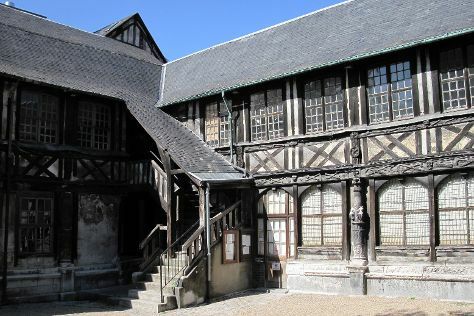 Venture out of the city with trips to Historial Jeanne d’Arc (in Rouen), Eglise Notre-Dame-des-Menus (in Boulogne-Billancourt) and Soissons (Cathedrale Saint-Gervais Saint-Protais & Abbaye Saint-Jean-des-Vignes). There's still lots to do: explore the historical opulence of Chateau of Coucy, take in the architecture and atmosphere at Eglise Saint-Germain-l'Auxerrois, get to know the fascinating history of Latin Quarter, and enjoy breathtaking views from La Tour Cesar. For traveler tips, other places to visit, maps, and other tourist information, read our Paris tour builder tool . Traveling by train from Avignon to Paris takes 3 hours. Alternatively, you can fly; or drive. Expect a bit cooler weather when traveling from Avignon in April: highs in Paris hover around 60°F, while lows dip to 42°F. On the 30th (Tue), wrap the sightseeing up by early afternoon so you can travel back home.